The Zoom Slot by Thunderkick is not a traditional game as you know it from many other software manufacturers. The Zoom Online Slots goes its own way and the idea behind it from Thunderkick is great. 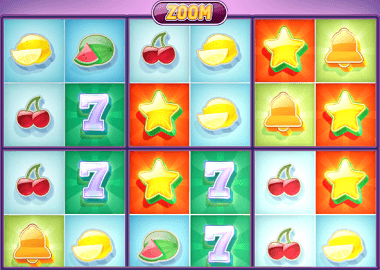 First, let’s say that the Zoom Slot is a fruit game. You play here on 6 reels with 40 symbols each. Thunderkick has donated 64 Paylines to this game. In addition to the normal symbols, there are a number of different mega symbols. These symbols make a big difference to other online slots. Symbols and payouts: The symbols on the Zoom Online Slot are relatively common. On your 6 reels land grapes, watermelons, lemons, stars, 7s, bells, cherries, wilds and Zs. All this is quite normal and just a typical fruit game. But quite new is the division of your symbols on the reels. There are six areas with 2×2 symbols on the Zoom Slot. When one of the zoom symbols appears, it always covers 2×2 normal symbols. The star is your most valuable symbol and you can earn with it winnings up to 1.500x your bet! Re-Spins Symbols:Every time a zoom symbol lands on your reels, you get a re-spins. It works like this: a zoom symbol appears and becomes a Massive 2×2 symbol. You are getting a re-spin now. If the re-spin lands another zoom symbol on your reels, you have the next 2×2 symbol and that activates the next re-spin. The feature runs as long as you get zoom symboles. On this way you get multiple winnings on many paylines. You can also form larger symbols in this way (Super Massive 4×4 symbols) and that means even higher profits. Maybe that does not sound as spectacular as the Zoom slot is actually. You have to try this game. That’s why you can play the Slot here for free. Just click on the slot banner above. Of course, 1.500x your bet profits do not sound that much. But wait, you can play from £0.10 to £100 here. Therefore the top prize is £150.000! This is far more than most fruit games. In addition, this game is perfect for newbies. There are no complicated rules and you don’t have to wait for hours for Free Spins features and Bonus games. The Zoom Online Slot can deliver big profits every second! The return to player is healthy 96.2%. If you want to play the slot with real money, the Casino Cruise or the Spinit Casino are recommendable. There, for example, you get a bonus and hundreds of bonus spins on your first deposit. Alternatively you can also find more Thunderkick casinos below. Casino Luck – Play 50 Starburst Free Spins! Casino Gods – New! Fresh! Bonuses and Free Spins! Free Play at 888 Casino – with £88 Bonus! Casimba – £2.000 Bonus and 125 Free Spins.